Apes are the members of the Hominoidea superfamily of primates. The hominoids consist of the various species of gibbons (or "lesser apes"), as well as gorillas, chimpanzees, bonobos, orangutans, and humans (collectively referred to as the "great apes"). Except for gorillas and humans, all true apes are agile climbers of trees. They are best described as omnivorous (generalized feeders that consume both animal protein and vegetation), their diet consisting of fruit, grass seeds, and in most cases some quantities of meat and invertebrates—either hunted or scavenged—along with anything else available and easily digested. They are native to Africa and Asia, although humans have spread to all parts of the world. The physical similarity between humans and other members of the "great apes" is so striking—indeed, DNA analysis puts the genetic similarity between humans and chimpanzees at more than 98 percent—that efforts are underway to treat apes as "persons" with various human-like "rights" (see cultural aspects of non-human apes). However, despite the remarkable physical similarity, the gulf between humans and other great apes (and other animals in general) is qualitatively huge, in terms of cultural, psychological, spiritual, emotional, and mental aspects. Humans have a complex language, use symbols in communication, write and read books, have set up diverse systems of governance, have remarkable self-awareness, conduct scientific experiments, practice religious traditions, have developed complex technologies, and so forth. Most non-human ape species are rare or endangered. The chief threat to most of the endangered species is loss of tropical rainforest habitat, though some populations are further imperiled by hunting for bushmeat. Primates are informally arranged into three groups, with apes forming part of the third category: prosimians, monkeys of the New World, and monkeys and apes of the Old World. The Old World monkeys are placed in the superfamily Cercopithecoidea in the clade, or parvorder, Catarrhini. Apes are placed in the superfamily Hominoidea of the same clade Catarrhini. From the point of view of superficial appearance, Old World monkeys are unlike apes in that most have tails. All living members of the apes are tailless. However, there are also primates in other families that lack tails. More specifically, the apes can be distinguished from these monkeys by the number of cusps on their molars (apes have five—the "Y-5" molar pattern, Old World monkeys have only four in a "bilophodont" pattern). Apes have more mobile shoulder joints and arms, ribcages that are flatter front-to-back, and a shorter, less mobile spine compared to Old World monkeys. These are all anatomical adaptations to vertical hanging and swinging locomotion (brachiation) in the apes. the family Hominidae consisting of gorillas, chimpanzees, orangutans, and humans, collectively known as the "great apes." However, the term "hominid" sometimes is used with the specific meaning of humans and extinct animals more closely related to humans than the other great apes (for example, australopithecines). Particularly, this is the case in anthropology, which has used the term for decades in this sense. Historically, it was common to divide the hominoids into three families, the Hylobatidae (gibbons), the Pongidae (orangutans, gorillas, chimpanzees, and bonobos), and the Hominidae (humans). In this case, the term hominid accurately applied to all human and humanlike forms, while great apes applied only to gorillas, chimpanzees (and bonobos), and orangutans. In the more recent and common scheme, noted above, hominid refer to all members of Hominidae, which includes gorillas, chimpanzees, organgutans and humans. There are other classification schemes, however. Some researchers place gorillas and chimpanzees (and the related bonobos) into the Panidae family, while orangutans remain in the Pongidae family, and humans in the Hominidae. Hominid also applies only to humans and their close relatives in this scheme. The bonobos are sometimes considered a variety of chimpanzees and are referred to as pygmy chimpanzees. The eight extant (living) genera of hominoids are the four "great ape" genera (Homo (humans), Pan (chimpanzees), Gorilla, and Pongo (orangutans)), and the four "lesser ape" genera of gibbons (Hylobates, Hoolock, Nomascus, and Symphalangus). The genus for the hoolock gibbons was changed from Bunopithecus to Hoolock (Mootnick and Groves 2005). The gibbon family, Hylobatidae, is composed of 13 medium-sized species. Their major distinction is their long arms, which they use to brachiate through the trees. As an adaptation to this arboreal lifestyle, their wrists are ball and socket joints. The largest of the gibbons, the Siamang, weighs up to 23 kg (50 lb). In comparison, the smallest great ape is the common chimpanzee at a modest 40 to 65 kg (88 to 143 lb). Chimpanzees, gorillas, humans, and orangutans are all more closely related to one another than any of these four genera are to the gibbons. It is now usual to use even finer divisions, such as subfamilies and tribes to distinguish which hominoids are being discussed. Current evidence implies that humans share a common, extinct ancestor with the chimpanzee line, from which they separated more recently than the gorilla line. Although the hominoid fossil record is far from complete, and the evidence is often fragmentary, there is enough to give a good outline of the evolutionary history of humans. The time of the split between humans and living apes used to be thought to have occurred 15 to 20 million years ago, or even up to 30 or 40 million years ago. Some apes occurring within that time period, such as Ramapithecus, used to be considered as hominids, and possible ancestors of humans. Later fossil finds indicated that Ramapithecus was more closely related to the orangutan, and new biochemical evidence indicated that the last common ancestor of humans and other hominids occurred between 5 and 10 million years ago, and probably in the lower end of that range. "Ape" (Old Eng. apa; Dutch aap; Old Ger. affo; Welsh epa; Old Czech op) is a word of uncertain origin and is possibly an onomatopoetic imitation of animal chatter. The term has a history of rather imprecise usage. Its earliest meaning was a tailless (and therefore human-like) non-human primate, but as zoological knowledge developed it became clear that taillessness occurred in a number of different and otherwise unrelated species. The original usage of "ape" in English may have referred to the baboon, an African Old World monkey. Two tailless species of macaque also are commonly named as apes, the Barbary Ape of North Africa (introduced into Gibraltar), Macaca sylvanus, and the Sulawesi Black Ape or Celebes Crested Macaque, M. nigra. Until a handful of decades ago, humans were thought to be distinctly set apart from the other apes (even from the other great apes), and even today many people still do not think of the term "apes" to include humans at all. However, from the point of view of current biological classification, humans are considered to be apes. The terms "non-human apes" or "non-human great apes" is used with increasing frequency to show the relationship of humans to the other apes while yet talking only about the non-human species. A group of apes may be referred to as a troop of apes or a shrewdness of apes. Both of these collective nouns seem to be equally common. The history of hominoid taxonomy is somewhat confusing and complex. The names of subgroups have changed their meaning over time as new evidence from fossil discoveries, anatomy comparisons, and DNA sequences, has changed understanding of the relationships between hominoids. The story of the hominoid taxonomy is one of gradual demotion of humans from a special position in the taxonomy to being one branch among many. It also illustrates the growing influence of cladistics (the science of classifying living things by strict descent) on taxonomy. In 1758, Carolus Linnaeus, relying on second- or third-hand accounts, placed a second species in Homo along with H. sapiens: Homo troglodytes ("cave-dwelling man"). It is not clear to which animal this name refers, as Linnaeus had no specimen to refer to, hence no precise description. Linnaeus named the orangutan Simia satyrus ("satyr monkey"). He placed the three genera Homo, Simia, and Lemur in the family of Primates. The troglodytes name was used for the chimpanzee by Johann Friedrich Blumenbach in 1775, but moved to the genus Simia. The orangutan was moved to the genus Pongo in 1799, by Lacépède. It is not pleasing to me that I must place humans among the primates, but man is intimately familiar with himself. Let's not quibble over words. It will be the same to me whatever name is applied. But I desperately seek from you and from the whole world a general difference between men and simians from the principles of Natural History. I certainly know of none. If only someone might tell me one! If I called man a simian or vice versa I would bring together all the theologians against me. Perhaps I ought to, in accordance with the law of Natural History (Linnaeus 1747). Accordingly, Blumenbach in the first edition of his Manual of Natural History (1779), proposed that the primates be divided into the Quadrumana (four-handed, i.e. apes and monkeys) and Bimana (two-handed, i.e. humans). This distinction was taken up by other naturalists, most notably Georges Cuvier. Some elevated the distinction to the level of order. The greater number of naturalists who have taken into consideration the whole structure of man, including his mental faculties, have followed Blumenbach and Cuvier, and have placed man in a separate Order, under the title of the Bimana, and therefore on an equality with the orders of the Quadrumana, Carnivora, etc. Recently many of our best naturalists have recurred to the view first propounded by Linnaeus, so remarkable for his sagacity, and have placed man in the same Order with the Quadrumana, under the title of the Primates. The justice of this conclusion will be admitted: for in the first place, we must bear in mind the comparative insignificance for classification of the great development of the brain in man, and that the strongly-marked differences between the skulls of man and the Quadrumana (lately insisted upon by Bischoff, Aeby, and others) apparently follow from their differently developed brains. In the second place, we must remember that nearly all the other and more important differences between man and the Quadrumana are manifestly adaptive in their nature, and relate chiefly to the erect position of man; such as the structure of his hand, foot, and pelvis, the curvature of his spine, and the position of his head (Darwin 1871). Until about 1960, the hominoids were usually divided into two families: humans and their extinct relatives in Hominidae, the other apes in Pongidae (Simpson 1945). The 1960s saw the application of techniques from molecular biology to primate taxonomy. M. Goodman used his 1963 immunological study of serum proteins to propose a division of the hominoids into three families, with the non-human great apes in Pongidae and the lesser apes (gibbons) in Hylobatidae (Goodman 1963). The trichotomy of hominoid families, however, prompted scientists to ask which family speciated first from the common hominoid ancestor. Within the superfamily Hominoidea, gibbons are the "outgroup": this means that the rest of the hominoids are more closely related to each other than any of them are to gibbons. This led to the placing of the other great apes (gorillas, orangutans, and chimpanzees) into the family Hominidae along with humans, by demoting the Pongidae to a subfamily. The Hominidae family now contained the subfamilies Homininae and Ponginae. Again, the three-way split in Ponginae led scientists to ask which of the three genera is least related to the others. Investigation showed orangutans to be the "outgroup" among the three great apes, but comparing humans to all three other hominid genera showed that African apes (chimpanzees and gorillas) and humans are more closely related to each other than any of them are to orangutans. This led to the placing of the African apes in the subfamily Homininae, forming another three-way split. This classification was first proposed by M. Goodman in 1974. To try to resolve the hominine trichotomy, some authors proposed the division of the subfamily Homininae into the tribes Gorillini (African apes) and Hominini (humans). However, DNA comparisons provide convincing evidence that within the subfamily Homininae, gorillas are the outgroup. This suggests that chimpanzees should be in Hominini along with humans. This classification was first proposed (though one rank lower) by M. Goodman et. al. in 1990. 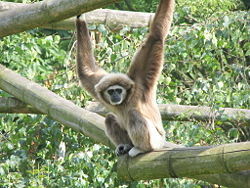 Later DNA comparisons split the gibbon genus Hylobates into four genera: Hylobates, Hoolock, Nomascus, and Symphalangus. As discussed above, hominoid taxonomy has undergone several changes. Current understanding is that the apes diverged from the Old World monkeys about 25 million years ago. The lesser and greater apes split about 18 million years ago, and the hominid splits happen 14 million years ago (Pongo), 7 million years ago (Gorilla), and 3 to 5 million years ago (Homo and Pan). The intelligence and humanoid appearance of non-human apes are responsible for legends that ascribe human qualities. For example, it has been said that they are the result of a curse—a Jewish folktale claims that one of the races who built the Tower of Babel became non-human apes as punishment, while a Muslim lore ascribes that the Jews of Elath became non-human apes as punishment for fishing on the Sabbath. A Christian folklore has claimed that non-human apes are a symbol of lust and were created by Satan in response to God's creation of humans. It is uncertain whether any of these references is to any specific non-human apes, since all date from a period when the distinction between non-human apes and monkeys was not widely understood, or not understood at all. Humans and the other apes share many similarities, including the ability to properly use tools and imitate others. Human beings are the only ape recognized as persons and protected in law by the United Nations Universal Declaration of Human Rights and by all governments, though to varying degrees. Chimpanzees, gorillas, and orangutans are not classified as persons, which means that where their interests intersect with that of humans they have no legal status. Some argue that the other apes' cognitive capacity, ability to experience emotions and some self-awareness, as well as their close genetic relationship to human beings, dictates an acknowledgment of personhood. For example, the Great Ape Project, founded by Australian philosopher Peter Singer, is campaigning to have the United Nations endorse its Declaration on Great Apes, which would extend to all species of chimpanzees, gorillas, and orangutans the protection of three basic interests: the right to life, the protection of individual liberty, and the prohibition of torture. They consider human beings, chimpanzees, bonobos, gorillas, and orangutans to be a "community of equals." However, despite genetic and morphological similarities between the other great apes and human beings, the gulf between these taxa is qualitatively immense. For example, in the Universal Declaration of Human Rights there are rights related to religion, politics, freedom of conscience, the arts, scientific advancement, government, and so forth. Such rights are unthinkable in terms of chimpanzees, gorillas, and orangutans. Goodman, M. 1974. Biochemical evidence on hominid phylogeny. Annual Review of Anthropology 3:203–228. Goodman, M., D. A. Tagle, D. H. Fitch, W. Bailey, J. Czelusniak, B. F. Koop, P. Benson, and J. L. Slightom. 1990. Primate evolution at the DNA level and a classification of hominoids. Journal of Molecular Evolution 30:260–266. Linnaeus, C. 1747. Letter of Carl Linnaeus to Johann Georg Gmelin, of February 25, 1747. Uppsala, Sweden: Swedish Linnaean Society. This page was last modified on 22 October 2012, at 16:00.